Exercise can be beneficial for any stage of life. Studies have consistently shown that exercise can boost your immune system. Moreover, it can help to strengthen your bones, prevent muscle wasting and help your mood too. Before you start any exercise or diet program, make sure you have discussed it with your doctor. Your physician can provide you with the information you need to keep you going strong and prevent injuries. He or she can also advise you about any warning signs or symptoms that you need to watch out for. Next, it is a good idea to set some realistic goals. A regular schedule of exercise is better than a hit and miss approach. The slow and steady route is the best one for the long run. Keep in mind that nothing happens overnight, and you need to make sure that you do not push yourself too hard. You might also want to discuss your diet with a nutritionist. Diet and exercise combined are much more effective than either one alone. Aquatic exercises. The water creates a low-impact workout environment and are wonderful for strength training and flexibility. Strength and resistance training. Use small weights, from 1-3 pounds. Aim for higher repetition and low weights to strengthen and condition your muscles. Join a class. Most communities offer various forms of dance and other types of classes such as low-impact aerobics. Bicycling is a great way to shed some extra pounds and keep your joints moving. You can use a stationary or regular bike. Jogging or walking with or without weights. Walking for 15 to 20 minutes at a time at a pace that does not leave you feeling breathless. Golf, tennis, bowling or other activities that keep you moving. Personal trainer or a physical therapist can help you get the most from a workout without hurting yourself. Exercise can help you as you age. 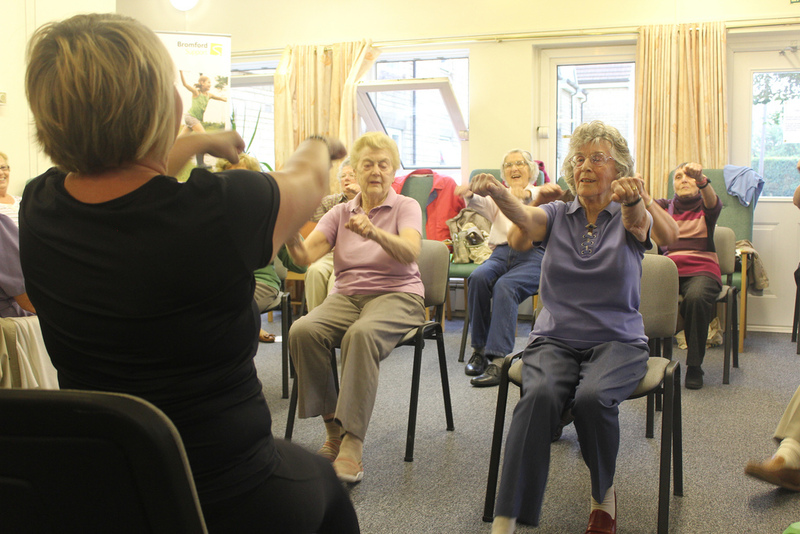 It helps you to remain flexible, keep your posture good and improve your balance and coordination (which can help you to avoid falls). Exercise can even improve your sleep. There is no reason that you can’t age gracefully and remain strong even into advanced age.